Oh Canada! Upper Deck Heads to Toronto For The 2011 NHLPA Rookie Showcase! The Upper Deck hockey team landed in Toronto late last night to start preparations for the 2011 NHLPA Rookie Showcase. 26 NHL star rookies will participate in a private signing with Upper Deck today, capturing their autos on card product, pucks and other items that we’ll be sharing with fans in the near future. 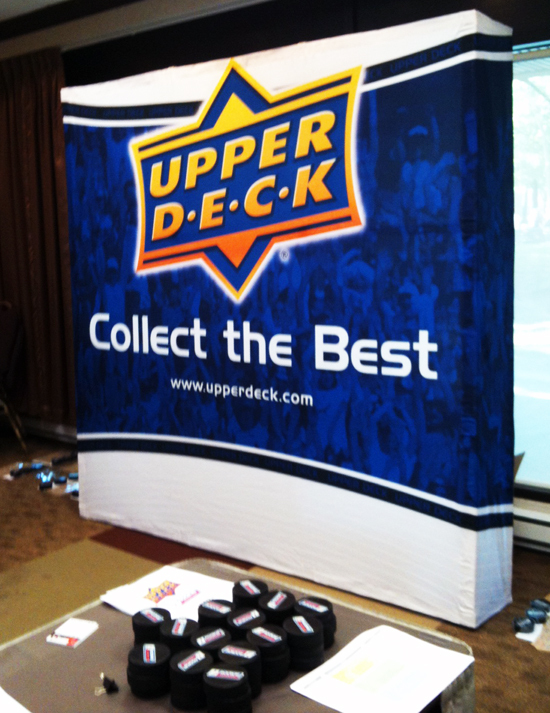 WELCOME TO THE NHL: Upper Deck is all set up in Toronto, ready for the 2011 NHL rookie class to put their ink on some UD cards and memorabilia! The group will be heading over to the MasterCard Centre tomorrow for a full day of on-ice action. We’ll be running these guys through the full Upper Deck gauntlet (and sharing it all with you!) with exclusive behind-the-scenes interviews, fun videos, trick shots and even more autos. SIGN HERE PLEASE: The rookies head down the line contributing their signature to some beautiful group signed helmets. READY TO GO: Signed labels ready to make their way to their trading cards and eventually the hands of lucky collectors in future UD products! WELCOME TO THE BIGS, KID: Washington Capitals rookie Cody Eakin shows off his autographed puck. Where can we buy these cards?